I went with big expectations of gorgeous sunsets, beautiful beaches, renowned surfing, and Maui sure has that in spades. What it also has is fancy shopping malls, golf course communities and lots of tourists, not my idea of escaping to paradise. Magazines and travel agents routinely tout Maui’s charms, and I had always wanted to visit. Here’s what I found. 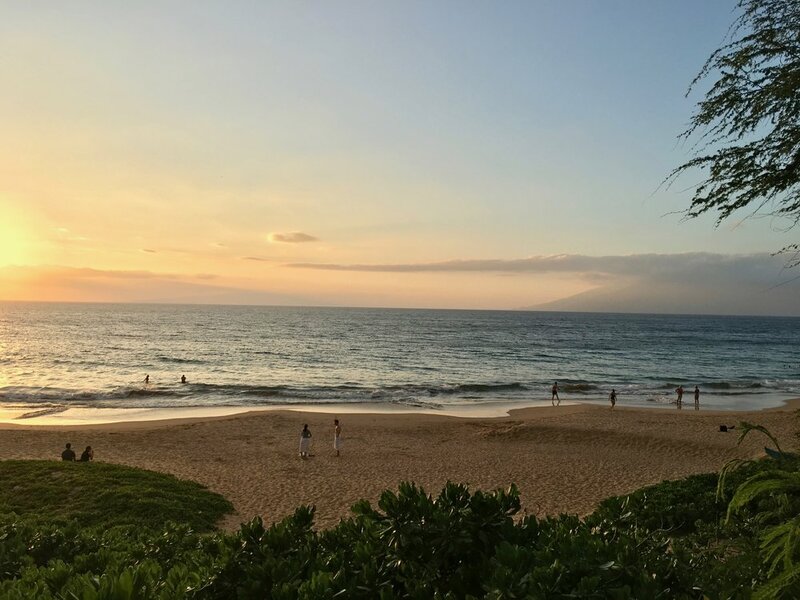 Who Should Go: Those who know me had warned me Maui was not my style—too big, commercial and crowded, but I also knew many friends who love it, who returned every year. Oprah has a house on the island. My cousin got married on the beach with just an officiant and the waves as witnesses. The weather is more consistently sunny than at rainier Kauai. And what did I think? Maui is big, overdeveloped and touristy, at least in Wailea where we stayed. Yet, we still had a fun, sun-filled few days and some excellent meals, finding pockets of quiet and beautiful scenery when we ventured away from the resort area. Remember, every traveler has different tastes and while Maui was not my speed many love the island. It is excellent for families, especially those with younger kids as there are a lot of activities, fun restaurants, and the beach is calm for swimming. Endless Activities: There’s a lot to do on Maui, the main draw for families. From hiking and biking to horseback riding trails, zip line adventures, helicopter tours, winery visits, a botanical garden, fishing, jet skiing, kite boarding, parasailing, diving and snorkeling—there’s something for everyone in your group. From December to April Humpback whale watching is a prime attraction, a magical experience if you’ve never had the opportunity to see whales up close. Golfers will be very pleased, with numerous legendary courses to keep them challenged. Let’s Hike: There are many great hikes on Maui, but for convenience the Hoapili Trail, commonly called the Kings Trail is a short 15-minute drive from the hotel. The 5.5-mile-long (round trip) trail begins on the beach at La Perouse Bay and follows a portion of the King’s Highway along the coastline. At one point the path weaves inland, passing through lava fields before heading back towards the ocean. There are beautiful water views throughout, some archaeological ruins, and natural ocean pools perfect for swimming or snorkeling. Nearby Beach: Right down the road from the Four Seasons is Makena Beach State Park, at the south end of Wailea. Locals love it for its gorgeous white sand and excellent swimming and bodysurfing. We went for a late day swim after hiking the Kings Trail mentioned above. Other Bites: The Four Seasons is home to steakhouse, Duo and Wolfgang Pucks’s Spago. Monkeypod Kitchen from award-winning Chef Peter Merriman is a buzzy place to go in Wailea, the food won’t blow you away, but it’s a fun night out. Coconuts in nearby Kikei is good for a super low-key lunch; people come in bathing suits and flip-flops for excellent fish tacos. During a visit to Lahina, I just loved Star Noodle and certainly not for the location in an industrial park on the edge of town. Share a few of the small plates such as the brussel sprouts or kalbi short ribs.Follow with miso salmon, garlic noodles or ramen—all delicious! We had dinner at popular Sensei for sushi in nearby Kihei —nothing to rave about but solid fare. Ka’ana kitchen at the Andaz looked excellent, but we ran out of nights. Elsewhere on the Island: It was too much of a trek from Wailea, but I would have liked to try the Hali’imaile General Store. If you’re staying at Kapalua, go to the Lahaina Grill. I was in Lahaina during the day but sadly it’s only opened for dinner, but it looked lovely. The Road to Hana: The round-trip drive time to Hana from the Four Seasons is six hours, without making stops along the route, but you don’t have to go all the way to experience the incredible views. The legendary drive is only 52 miles from the starting point, but thanks to windy, narrow roads, 59 bridges, and hairpin turns it can take anywhere from two to four hours. But, what a drive--passing rainforests, waterfalls, and dramatic water views –all just off the road. Drive as far as your inclined, stop and enjoy a hike or swim at one of the waterfalls, or a picnic Wainapanapa, a black sand beach. Set Your Clock Sunrise: We didn’t wake up at 4:30 for sunrise at Haleakala National Park, I couldn’t convince the two college kids fresh off of finals week to go with me-- it was their vacation after all. (And mine!) I hear it can be extraordinary if you get lucky with the weather and the crowds aren’t too bad—for more information click here. Note round trip driving time from Wailea to Haleakala is four-and-a-half hours. Would I Go Back: Not to Wailea. I’d rent a house upcountry away from the big chains and resorts or head to quieter, more laid back Hana situated on Maui’s eastern coastline, known as the last remaining throwback to the old charms and pace of the island.